This largest California land mammal, weighing up to 2300 pounds, once numbered 10,000 and ranged from the coast to the mountains. California Indian tribes revered and feared this great predator. The bear was an omnivore eating berries, roots, fish and small animals. They rarely hunted larger animals. Today its closest surviving relatives are the grizzly bears living on the southern coast of Alaska. The decline of the California Golden Bear started with the arrival of Spanish settlers in 1769. The spread of ranchos and farms reduced food available to the bears and drove them into the foothills. Besides hunting the bears, the Spanish captured bears to provide the spectacle of bull/bears fights and the practice continued after Americans arrived. As the bears’ range was reduced, they began attacking and killing livestock. The upsurge of people arriving for the Gold Rush brought more powerful guns, traps and poisons and the skill to rid the area of bears. While some bears were killed to protect people and their livestock, more were killed for sport and for bragging rights. The last California Golden Bear was shot in 1922 and the last sighting in the Sierras was in 1924 but the bear has not been forgotten. 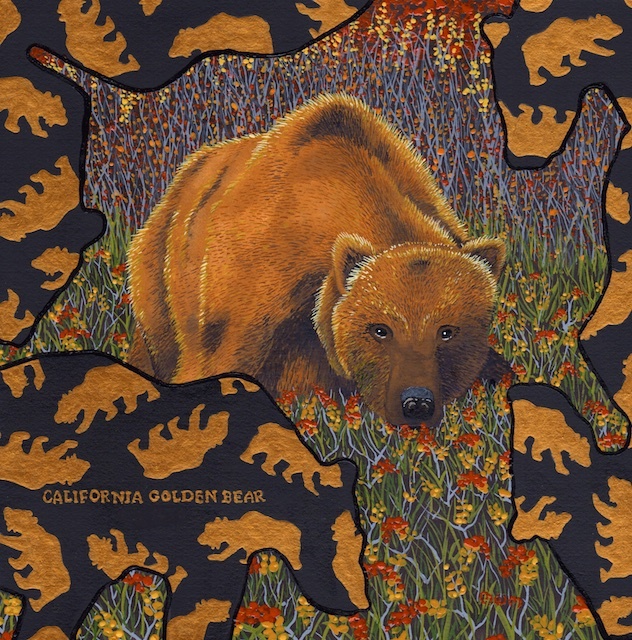 The California flag and seal display the extinct animal in remembrance of the Bear Flag Revolt of 1846 that led to California joining the United States. In 1953, the extinct bear was designated the state animal of California and it is the mascot of many California sports teams.